Alexandrovsky Sad (Alexander Garden) is a landmark in Moscow centre and near metro station Alexandrovsky Sad. Each day thousands of passers-by walk along its paths. The garden is famous for its architectural monuments, incredibly beautiful flowerbeds and history. It commemorates Russian victories and those that died in war of 1812 with Napoleon and in both World Wars. Highlighted by Kremlin Kutafya Tower is the eternal flame memorial (in memory of the fallen heroes in World War II 1941-1945) and the big fountain with horse sculptures. 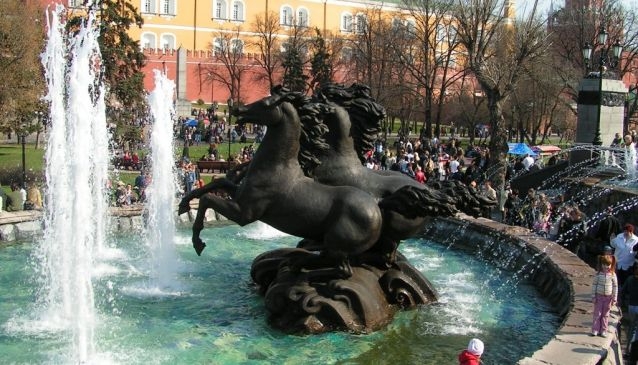 They were created by popular Moscow architect Zereteli. In hot weather the fountain becomes a water attraction for teenagers. The garden is undergoing a lot of changes, in 2012 old trees were cut down and over 200 ones were planted instead with 2700 shrubberies. Moscow authorities claim that there will be a rosary for 3000 roses and the blue spruce in the central part will be decorated as a New Year tree. The number of lamps will double, so night time may turn into real magic there, right in the heart of Moscow. A garden which is impossible to miss; it's a place which represents Moscow's history.